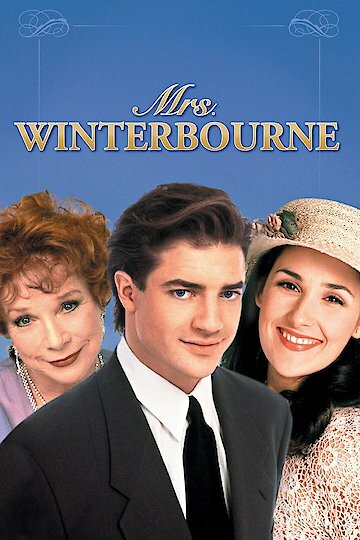 "The story of a girl who is going from filthy to rich"
Mrs. Winterbourne is a delightful romantic comedy/drama from the mid 90's. The movie was based loosely upon I Married a Dead Man by Cornell Woolrich. The main character of the movie is a young woman named Connie Doyle. Connie lost her mother at a young age and was very unhappy at home. The day of her 18th birthday she chooses to leave home and to head for New York City where she meets slimeball Steve DeCunzo that same day. He sweeps her off of her feet and she immediately moves in with him. Unfortunately, she doesn't realize that he isn't what he seems to be until she is already pregnant with his baby. He kicks her out without a penny to her name and with nowhere to go. Connie manages on the streets for quite some time but the birth of her baby is drawing near. She is in Grand Central Station when she gets accidentally pushed aboard a train. She doesn't have a ticket and is being harrassed by the train's ticket taker when Hugh Winterbourne sweeps in and saves her by pretending to be her husband. He takes her to his private train car where his pregnant wife Patricia is waiting, who is also very pregnant. While Hugh leaves to get refreshments the two women bond together with Patricia even letting Connie try on her wedding ring. The train crashes and Connie wakes up in a fancy hospital and she isn't pregnant anymore. Thankfully, her baby boy is fine but there has been a mishap. Patricia, Hugh and their unborn son passed away in the train accident but they believe Connie is Patricia because she was wearing Patricia's ring when the accident happened. Hugh's very rich and loving family takes in Connie and her baby and the comedy, chaos and heartfelt drama that ensue are worth tuning in to see how it all turns out. Mrs. Winterbourne is currently available to watch and stream, buy on demand at Amazon, Vudu, Google Play, FandangoNow, iTunes, YouTube VOD online.